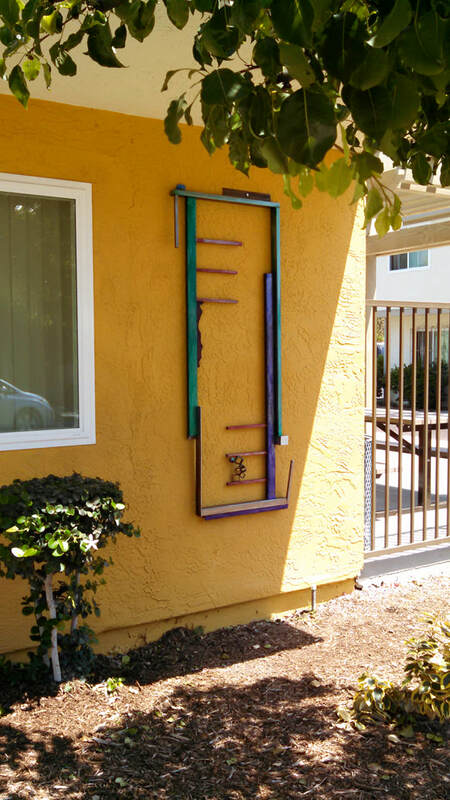 A list of public art located in affordable housing complexes. 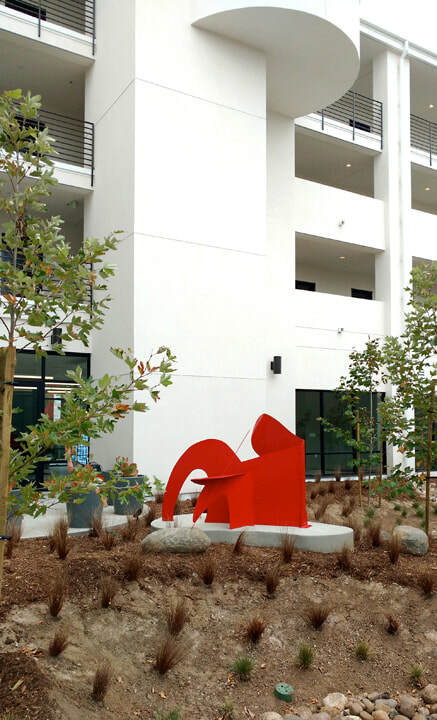 Within the organic garden of this seniors complex are two sculptures. Citrus trees and raised beds surround them. The Device for Sound Making". This steel device can be cranked to make sound. Beautiful in its own way, but not music. An internal paddle moves things around. What are thy? This can be used to start a meditation. It can be a mind clearer. It can be a hip thing to share with one's grandchildren. "What is big and red and eats rocks?" The Secret Garden at Mayberry is a place of peacefulness for the residents for this apartment complex. 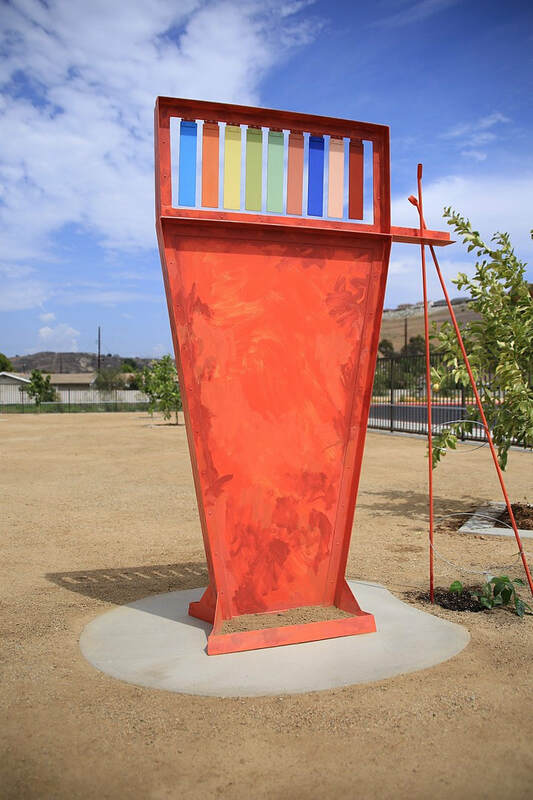 There is a labyrinth/maze, plants to harvest and a bench that has art around it. The other side of the wall is on a busy street. You can feel it, and yet the garden is a place of respite. 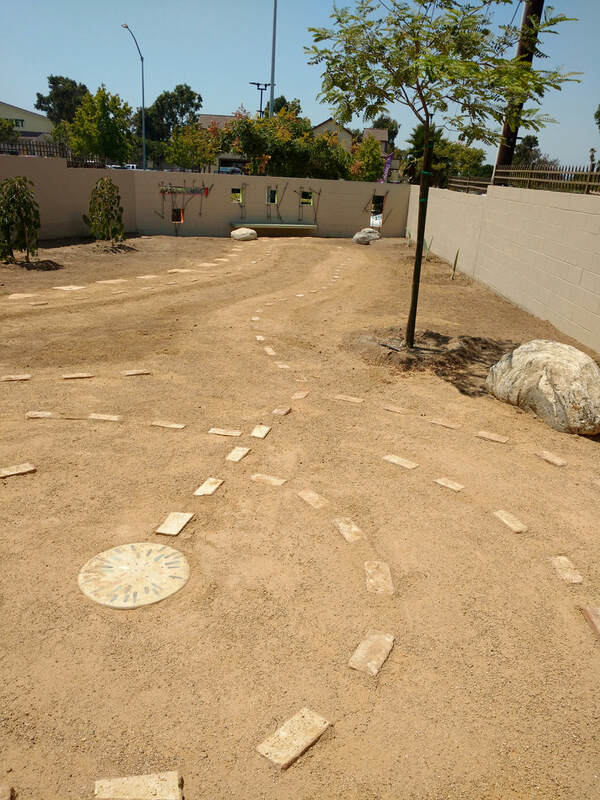 The modified traditional labyrinth is made of recycled bricks, and at the center, a mosaic paver. Sit on the rock under the shade of the tipuana tree or check if the weeping mulberries have fruit. Picnic on the bench while the kids crawl on the rocks. Who has the best recipes for tunas or nopale? 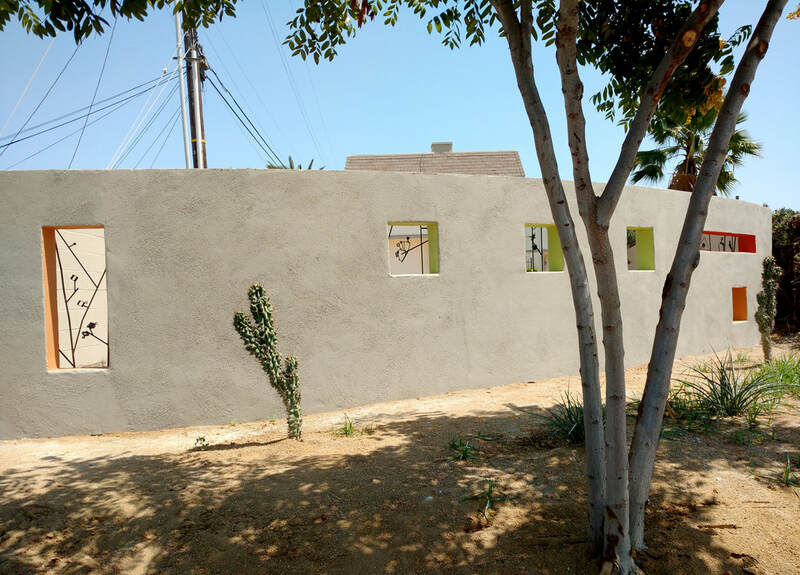 Abstracted plants in a metal design fill the window spaces. Like plants in a dream. They also give lumbar support at the bench. Vibrant is an understatement for the color within the windows. Electric melon perhaps, which is only seen from the side. A flash when driving by the curved wall. 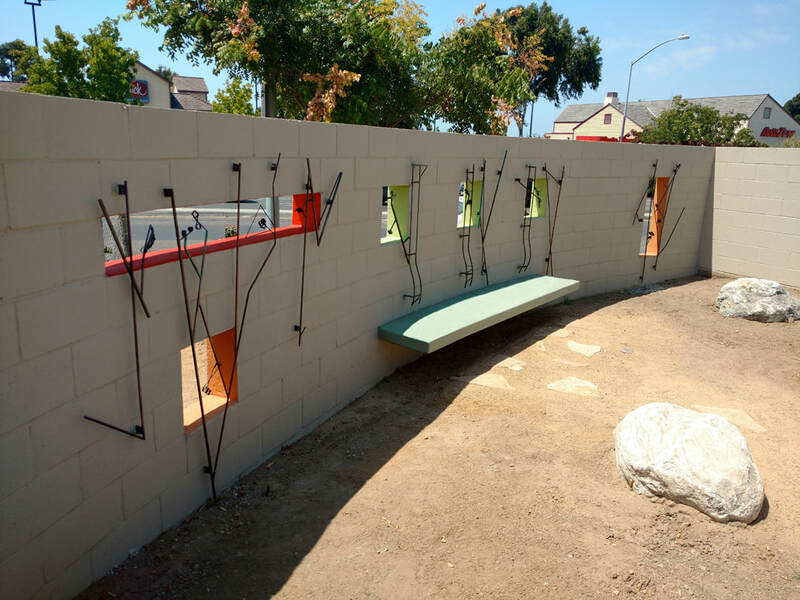 The wall piece at the community room is a public presentation. It is formally abstract. It has tempo and rhythm. It has the same patina and a hint of the square blossoms from the garden. Lively, playful and yet serious. Its like an old person saying something really funny to a teenager. ​Flow” and “Evaporation” are two distinct art pieces that work in tandem, just like nature. “Flow” represents a creek in motion- turbulent and then sometimes dry. Water-loving Juncus grasses are shown in the texture. 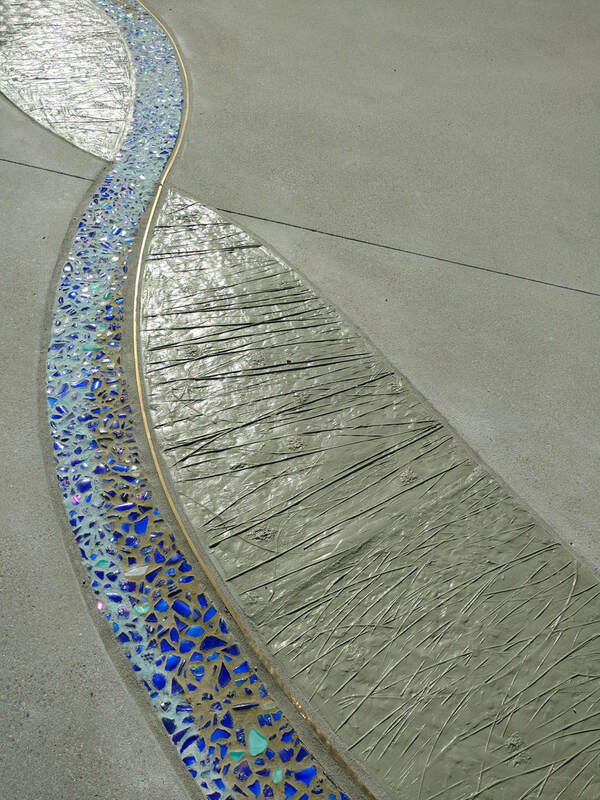 Recycled blue glass gives the mosaic the depth of water. Brass is the glint of water reflecting the sky. 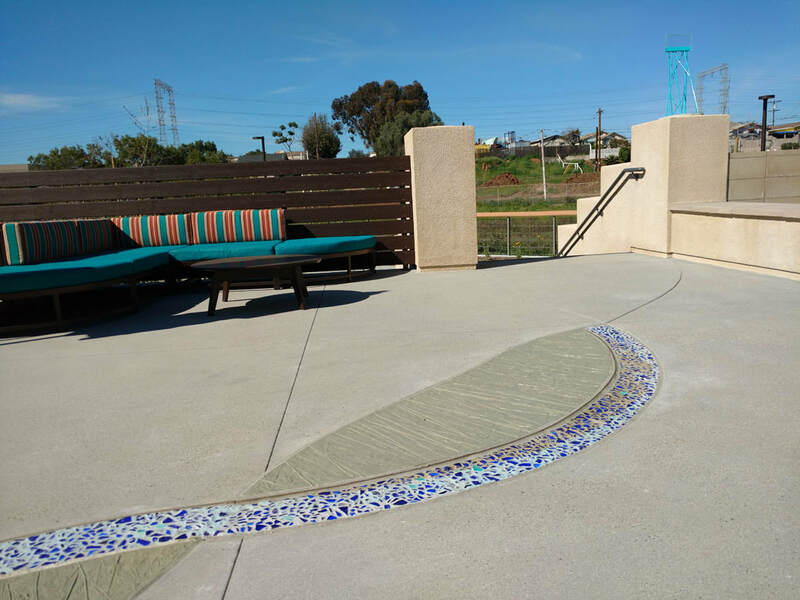 This swirling path leaves the clubhouse and directs us to notice Paradise Creek. 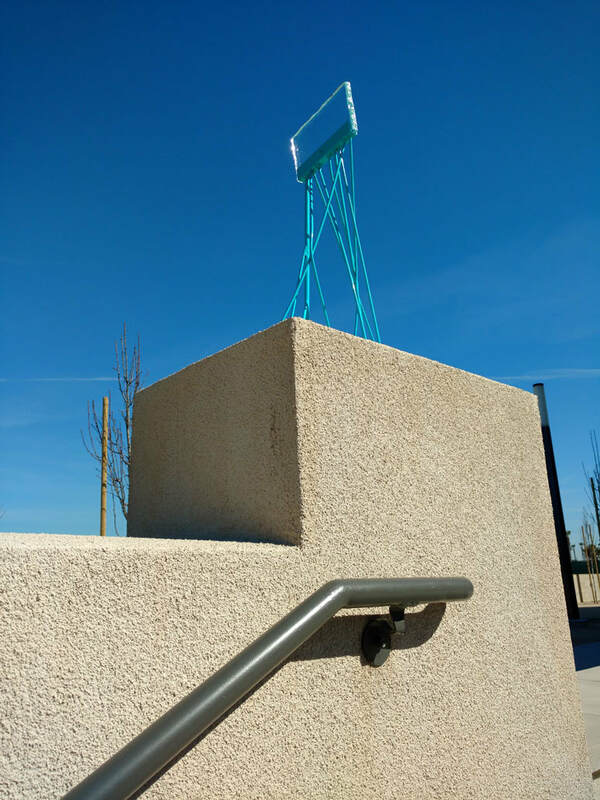 Then one passes by an odd blue metal and glass sculpture. Water is transparent. I used glass to show the ‘have + release’ of humidity. In its abstracted way, it shows how nature does its cycle. In the high foot traveled area by the trolley on Commercial and 22nd, a pedestrian will notice pavers in the sidewalk with words which cause that walker to think. 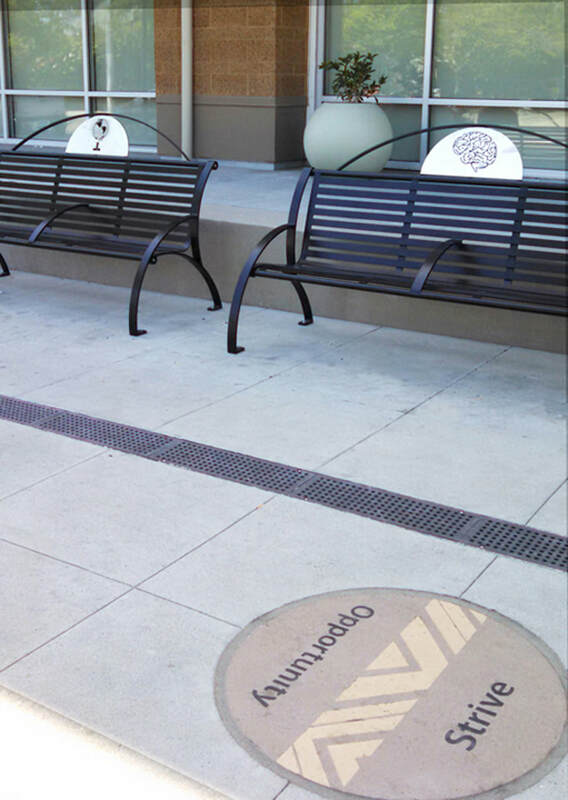 One will also see benches augmented with graphic designs that link to the surroundings and to the pavers. Hence sitters are thinkers as well. The words and images in juxtaposition are like a walking poem. In the spirit of community involvement, options for both the words and graphic were given to the neighbors. This voting was done on a facebook interface (as well as old world paper). In this way everyone who participated in the voting can feel a direct connection.